COLOMBES, France--(BUSINESS WIRE)--IDEMIA, the global leader in Augmented Identity for an increasingly digital world, announces today that it has implemented facial recognition technology on EasyOpen, a solution previously developed with its partner Omoove, a wholly-owned Octo Telematics company, Europe’s leading Shared Mobility technology provider. The digital enrolment process combined with facial recognition technology will securely enroll and authenticate the driver before EasyOpen automatically opens the car. 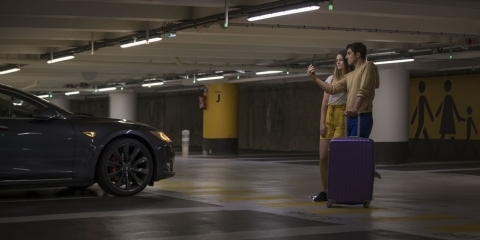 This solution uses the smartphone to create the identity of the driver by registering ID documents in a fast and user-friendly way, while afterwards granting access to the car through a selfie thanks to IDEMIA’s facial recognition solution. According to a study run by Frost & Sullivan (www.frost.com), car sharing users number should increase by 16,4% CAGR within 2025 : private car usage will then decrease and car rental agencies will need high performing technologies to secure shared cars. In that context, IDEMIA and Omoove strengthen their position on this promising market with the extremely simple, intuitive and fast EasyOpen solution. A demonstration of EasyOpen will take place at the Mobile World Congress 2018: end-to-end customer journey from registration on car rental application to opening of the car thanks to a selfie will be presented on this occasion on a Maserati Levante. Giuseppe Zuco, CEO at Omoove and Octo Telematics co-founder, added: “We are pleased to participate once again with IDEMIA at the MWC; together with strengthening our partnership, we continue to share our expertise in automotive solutions and IoT applications. We look forward to showing a new mobility experience, through advanced biometrics and secure digital identity management. The keyless connected car will unveil a new era of shared Mobility, by simplifying the driver journey and allowing operators to offer a simple and reliable solution”. No keys, no card, you only need a smartphone to open the car and start the journey! Omoove operates more than 10 car sharing services in 15 cities with about 200.000 connected vehicles and scooters, 900.000 registered users and more than 400.000 rentals per month (as of 31 December 2017). Founded in 2001, Omoove is wholly-owned by Octo Telematics, the largest and most experienced insurance telematics company in the world for number of registered users and managed vehicles. Omoove is headquartered in Rome with local offices in France, Spain, UK, Germany and the United States.